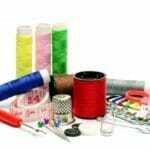 Yay – you made it through the exchange of emails and the sign up process and you are now on the mailing list and a member of the So Sew Easy team – welcome aboard. l'm delighted you're following along. Before you go, I want to make sure you've seen some of the great content here for you and invite you to ENTER the monthly sewing pattern GIVEAWAY below. 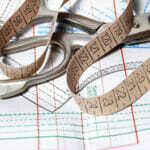 Here is just a selection of some of the articles and resources you can find on So Sew Easy. Check these out and remember to bookmark your favorite pages, and why not share them with your sewing and crafty friends on Pinterest too. 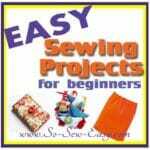 In fact, while you are here, you should probably follow the So Sew Easy Pinterest boards. There's LOTS of great stuff on there. There are links to some of my favorites below. Check out these boards on Pinterest. 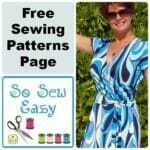 Follow So Sew Easy's board FREE sewing patterns on Pinterest. 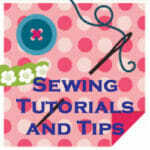 Follow So Sew Easy's board Sewing tutorials and tips (SSE) on Pinterest. Do you have a split-skirt here? ‘looked but must have missed it. I’m sure you’ll find what you’re looking for. I cannot download the Easy Sew Cosmetic bag pattern as Craftsy is telling me to put it in my pattern library…how can I do that? Thanks Kathleen. We appreciate the support. 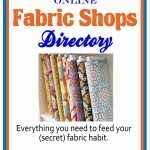 Just found you and have saved several of your patterns from Craftsy already this morning: I quilt and make totes, but never have done clothing. Looked most of the summer for a bathing suit coverup. Never did find anything that I liked; saw your tunic pattern and a few others and think I’m on to something I can make and will enjoy wearing. THANK YOU!